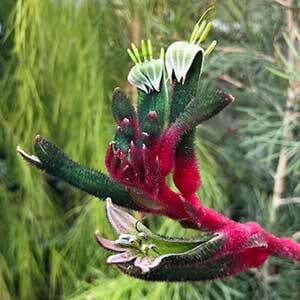 A bird attracting plant, Kangaroo paws ( Anigozanthos ) have highly decorative flowers, a come in a wide range of colours and are long flowering. Originally from Western Australia, these are one of the first Australian Plants to be extensively hybridised. The foliage is attractive all year round, however it is the long lasting colorful flowers that appear in early summer that we grow these amazing plants for. Well known and are used in landscaping applications around the world. They not only come in a range of colors they also include dwarf varieties. Hybrid cultivars such as ‘Bush Gem’ are a little bit easier to grow and readily available for sale in the eastern states, more disease resistant and generally providing a longer life span. Popular as a cut flower, the Black & Green Kangaroo Paw is actually a different species ( Macropidia fuliginosa ) it prefers a drier soil and can be difficult to grow, but well worth the effort for the enthusiast. Fairly easy to grow and care for, they require a well drained soil and a position in full sun, with a good amount of compost or organic matter added. Protect young plants from snails. Divide clumps to promote new growth and keep them healthy. In frost prone areas they can be cut back to 8 – 12 cm in late winter to prevent damage. The main disease problem is rot caused by the plants being to wet, over use of mulch around the base of the plants will cause problems. The appearance of black marks on the foliage is indicative of ‘ink disease’ infected plants should be removed and disposed of (not composted), fungicides can be used if needed. Slugs and snail can be a problem with young plants, take the usual precautions. 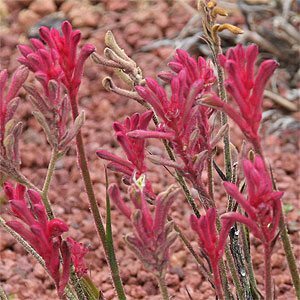 Kangaroo paw plants require full sun or partial shade and a well drained soil, they can be grown in well drained pots and colours include yellow red and black. It is interesting to know that many gardeners believe the secret to growing healthy Kangaroo paws is pruning. Cutting right back to the ground in late summer to autumn is the preferred method. Make sure when you do prune that you leave any new growth, or new flower buds, use some sharp secateurs and prune away. Pruning not only encourages new healthy growth, but it also helps prevent disease. Remember to clean up all of those pruning and consider giving your plants a good helping of Australian Native Plant food. A little mulch and a good watering if it has been dry. You can also prune the older flower heads away as soon as they start to look a little ragged. By doing this you may get a second flush of flowers. Simply use a sharp pair of secateurs and prune the old flower stem at an angle close to the base. We have had lots of questions about this and the answer comes in two parts. Firstly they do not like to get wet feet, so good drainage is essential. Secondly, SOME of the new cultivars are very pretty, HOWEVER some are also relatively short lived. They will last 2 – 3 years and then just ‘give up’. The problem is that these plants from Western Australia do not like humidity, and some of the cultivars are extra sensitive, so on the East Coast – they die. The smaller growing plants ‘dwarf types’ seem to be the worst. And over fertilization is a killer, try not to fertilise at all. Ink disease is another problem. This is a disease that presents as dark spots, the plants them wilt and die. Some growers cut right back after flowering, leave the cut foliage on the plant base until it dries, and then burn it, a ‘quick clean burn’ that last a minute, with no additional fuel load added. Ferns and Tree Ferns, Tasmanian Tree Ferns. Ferns and Bromeliads on Tree Fern Backing Boards, Bromeliads, Kangaroo Paw, Sphagnum Moss, Hypoestes Phyllostachya, Phalaenopsis.